If you dont have an account and would like to pay by card we can offer this service via PayPal, for any purchase through Fibre4TV. PayPal also offers other ways to pay, and these options will show on the invoice link you receive. Direct bank transfer is also an option (BACS). 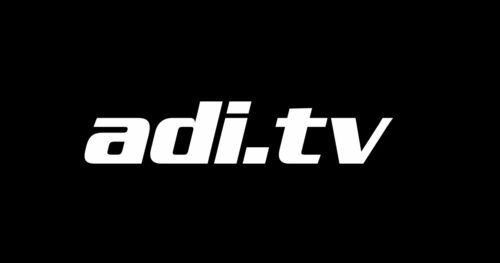 Fibre4TV was proud to supply ADI.TV UK with our IP-Tactical range of IPLC-TAC2 cables for there coverage of the Formula E championship. The order was for a range of lengths from 200m up to 500m. And consisted of breaking out the TAC4 cable to 2x IPLC-TAC2 connectors. The breakout was protected by a braided sleeve to aid the rigging. Metro Ecosse had Fibre4TV complete their fibre install of the new Scottish Power Head Quarters up in Glasgow. 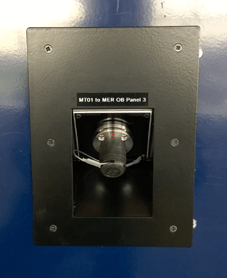 Having pre-installed 4 core multimode around the complex, Fibre4TV were called in at short notice to fit Neutrik DUO connectors on the various inject points around the auditorium and other communication rooms. 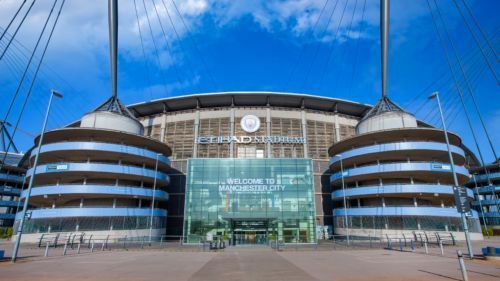 Dimension Data commissioned Fibre4TV to install various inject points around the brand new, state of the art, training facility at Manchester City’s Etihad Campus. A partnership of BBC Music and Glastonbury Festival organisers commissioned Fibre4TV to install a permanent fibre back-bone around the Worthy Farm estate. Due to the ‘natural’ conditions that the cable lives in, Fibre4TV make an annual maintenance visit, pre-festival, to ensure that when the worlds eyes turn to Somerset, the fibre back-bone is ready to go. Fibre4TV continued its professional connection with the Middle East in 2014 as 2 substantial orders came in from the area. Jordan based Heat for Engineering & Technology came to us requiring some shorter LEMO terminated SMPTE assemblies. 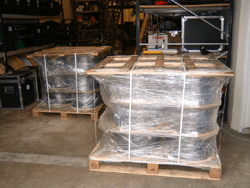 They were after 4x 30m lengths terminated with the LEMO PUW-FUW, 6x 30m with PUW-FMW connectors and 6x 25m lengths with PUW-FMW connectors. All terminated, tested and boxed in under a week it was the small matter of the Certificate of Origin and correct shipping documents. Once done, the shipment was out the door within a couple of weeks and on to the next one. In the lead up to Christmas United Arab Emirates based Live Productions, a TV production services provider, came to us with a short time scale and a large requirement. 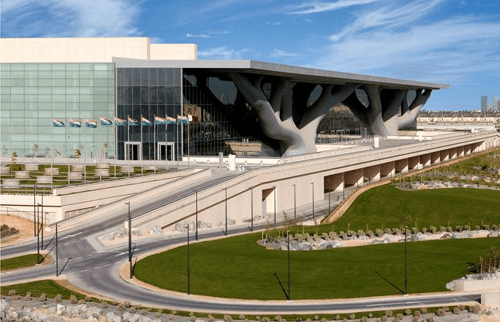 For permanent install in Abu Dhabi, they required 39 SMPTE assemblies, all terminated with LEMO connectors. Cut to length and put on wooden drums we exposed both ends to terminate the longer lengths. These included 25x 300m and 2x 600m lengths all with LEMO FUW-PUW connectors. The shorter lengths included 10x 7m and 2x 5m PUW-FMW lengths and 12x 75cm chassis to LC/Bare copper, 6x FXW and 6x EDW. A box of M20 one-click cleaning pens later and we were ready to test and palletise all before Christmas. Fibre4TV has a good stock of a range of SMPTE fibre cable and LEMO 3K.93C connectors, short lead times and a full range of repair services. See what we can do for you in the fibre shop. February and April saw Fibre4TV returning to Doha for different jobs with their own unique challenges. Techno Q, a Qatar based company, is an industry leading systems integrator specialising in audio-visual, building controls, fire & security systems, lighting, information technology, broadcast, and hospitality management solutions. They had projects that required Lemo terminations at two sites. The Abdullah Bin Khalifa Stadium also known as Lekhwiya Sports Stadium (which is owned by the Kings son and is also the Doha’s police force training ground) and the QNCC (Qatar National Convention Centre). The stadium site contained 13 cables and the most challenges. With termination being required by the use of splicing into pitch side AV boxes and a main OB room rack. Before flying out to do this job some of the prep work was carried out back at base, in-house, to aid in achieving the tight timescale that was put on this site as an Arabian champions league match was due to be played 4 days after Mi Broadcasts arrival in Doha. Most of the challenges where from narrow, almost impossible locations of the field boxes, along with the depth and population of these boxes, that required us to protect the splices in armoured conduit. Despite this the job was completed on time and was tested to the full with the first match being televised across Qatar and the UAE. The QNCC site is an open and fully functioning building to the public and required the termination of 12 cables. These all came from 6 boxes in one room to a main control panel in the OB dock. On this site Mi Broadcast used a different method of termination due to the boxes being only just deep enough to house the Lemo chassis along with the Triax and BNC’s, and allowed no room for heavy duty protection. 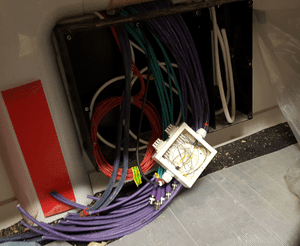 The solution used was to breakout the installed cables and terminate ST’s to 3mm cable and crimp the copper wires into a Mate’N’Lok connector. Before travelling for the second visit preparation of the chassis assemblies was completed and tested in-house allowing for the site work to be a case of breaking out the very short cables, terminating and plugging into the pre-made chassis connector. This solution also allows for easy replacement of any chassis in the event of damage due to its plug and play nature. For more on our range of terminations please see our Products section or contact us with your enquiry.